OMG, this was amazing. I knew this would be more of a "crisp" and not a "cobbler" type of dessert, which I'm not crazy about...but boy did this prove me wrong. I prefer a nice dough-y, pie crust-like topping for a peach cobbler, but the crunch and sweetness of the crisp topping was like nothing I've ever had. Even after sitting in the fridge overnight, the topping was still crisp and hadn't gotten soggy like I'd expected. The peaches were simply tossed with sugar and lemon juice, but there was enough lemon juice to make it tart. I was worried the peaches wouldn't be sweet enough...but then there's that delicious topping again, which had the perfect amount of sugar and was the perfect complement to the semi-tartness of the peaches. What makes this recipe even greater is the simplicity of it and the fact that probably 95% of the ingredients were already in my cupboard and/or fridge. In fact, I think I only needed to buy the peaches (which I bought frozen, two 16-oz bags was enough for the needed 6 cups chopped) and a lemon. Make again? Definitely, and I'd eat it for breakfast and dessert. I'm sure any other fruit would go wonderfully as a substitute for the peaches...but don't change a thing about that topping! I'm def. going to have to try this one out. 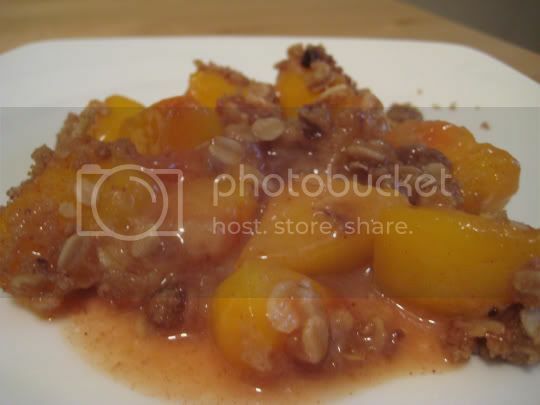 I'm always craving a peach cobbler. Wait, where do I get the recipe if it's not on the site?